The purpose of the L. Paul Soucy Trophy is to recognize the pilot who achieves the highest scoring percentage at three or more contests during a contest season (best scores averaged together). To qualify, one of those contests must be the U.S. National Aerobatic Championships. Larry is a retired Air Canada pilot and has been involved in competition flying since 1986. 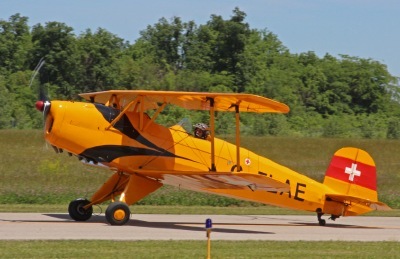 He is active in IAC chapter 88 (Michigan) and Aerobatics Canada Chapter 3. Larry is an aerobatic judge and Contest Director, having even directed the Canadian Nationals. He flies a beautiful Bücker Jungmann which he spent 11 years building. The Soucy award came fairly easily with several percentage points separating Larry from second place. His best score was at the Michigan Aerobatic Open with an amazing 91.77%. His overall average for the year was 87.62%. Congratulations to you, Larry Ernewein, for your well-deserved success!